I don't maintain a "top Nike sneakers to cop" list but if I do, Nike Air Yeezy II will be there on the top of the list...ok la, maybe next to my all time most wanted shoe but pretty much impossible to get - the Nike MAG. The peeps at Swoosh have finally revealed the official release of the much awaited kicks which will be on June 9th. 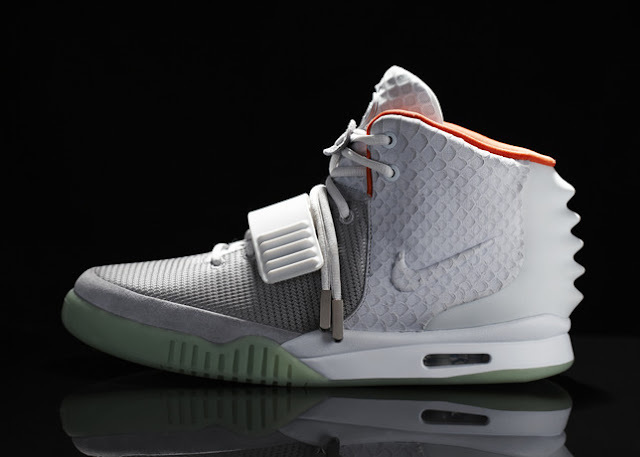 "A primal, tactile approach to technology runs throughout every element of the Nike Air Yeezy II. Armored animalistic forms imbue the upper. Hand skived anaconda textured leather quarter panels are embellished with a debossed Vac-Tech Nike Swoosh. The molded rear is sculpted with a reptilian inspired spike, while an engineered strap with scaled down spikes was developed to offer a greater sense of symmetry and lock down. An obsessive approach to materials results in a luxurious mix of leather, rugged ballistic nylon, and soft nubuck. Concealed but opulent details reference ancient civilizations, including a loop strap with hieroglyphics that spell out 'YZY.' Each screw on lace aglet is obelisk shaped, and the anaconda texture is echoed on the eyelets and leather lace toggle that carries the Roman numeral 'II.'" 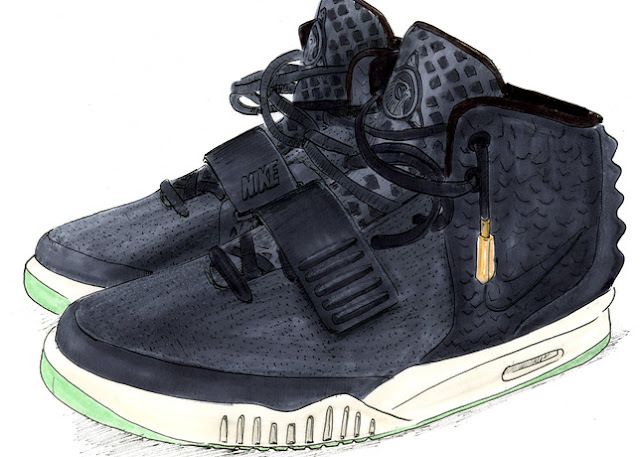 Designer's sketch of Nike Air Yeezy II. Judging from the Malaysian release of the original Nike Yezzy back in 2009, I predict that Sole What most probably will be given the responsibility once again to release the kicks to Malaysian sneakers crowd and I expect it to be released by ballot once again. No official price yet but I'm expecting it to be around the region of RM 800. There still more photos of Nike Air Yeezy II after the jump, so click on "THE STORY CONTINUES HERE" link below to check them out. Despite being a huge metropolitan, I found that it is hard to find a joint that used English as the communication medium in Shanghai, China. Hooters Shanghai is one of the exception and better still, it is located just next to the hotel where I was staying during my recent trip to HP Global Influencer Summit 2012. Chap's Lumia Travelogue is a series of photos and videos that I captured with Nokia Lumia Windows Phone throughout my travels. The video above was recorded using Nokia Lumia 800 Windows Phone, courtesy of Nokia Malaysia. Ever heard of Segway PT before? It is a single-rider two-wheeled electric vehicle that operates using a combination of computers, tilt sensors and gyroscopes to balance itself out when a user rides on it. Prior to its original release in 2001, it managed to generate lots of hype to the extent that a renowned venture capitalist, John Doeer said that it would be more important than the Internet. Well, in the end, that proved to be a huge bull crap. ChapKixView: Sole What x Nike Cortez iD "Soles For Love"
Called "Sole For Love", this particular Nike Cortez iD is the result of a collabration between renowned local sneaker store Sole What and Nike in conjunction with the celebration of Nike Cortez's 40th anniversary. With only 26 pairs were made and available exclusively at the recent Cortez 40/40 KL event in Juice KL, all proceeds from the sale of the collab piece will be handed over to a local charity called Dignity For Children. As shown above, I managed to check out the release personally at the Cortez 40/40 KL event. Personally, am not exactly a fan of the suade's top but I do like the clean combination of grey and yellow colorways together with the light blue finishing. I also prefer this version of Cortez rather than the OG version as the OG has way thinner sole. What made the release more attractive to me is the fact that it is a complete package: you have the shoe, a matching Sole What t-shirt and a display case. Not to forget the fact that it is created via Nike iD custom shoe service that is not available here in Malaysia and pretty much explained the extremely limited amount of available units. Also, with all the proceeds from the sale are going to charity, this Sole What x Nike Cortez iD "Soles For Love" is definitely a winner in my book. I'm not sure of its status for the time being but just in case that you want it, get in touch with Sole What or Juice KL to find out if they actually have leftovers stock from the event. Fighting and free, got your world in my hand"
Last night, I spent 2 hours watching Queen: Days of Our Lives documentary that was made by BBC for the band's 40th anniversary last year. I got to say that the documentary was very well made, inspiring and ought to make a rock star out of somebody - the same feeling that I felt when I watched Foo Fighters' Back and Forth documentary not long ago. Given that I only knew a handful of Queen's songs, I discovered a lot of other songs as well such as the one above. But then again, I was still a little kid when I saw Highlander on RTM back then. "Everybody gets knock down...how quick are you gonna get up?"